What a nasty man Ben Brown came across as in that interview. And full credit to McIntyre for retaining his composure and highlighting the craven attempt at manipulation engaged in by the interviewer. Good work, Jim! 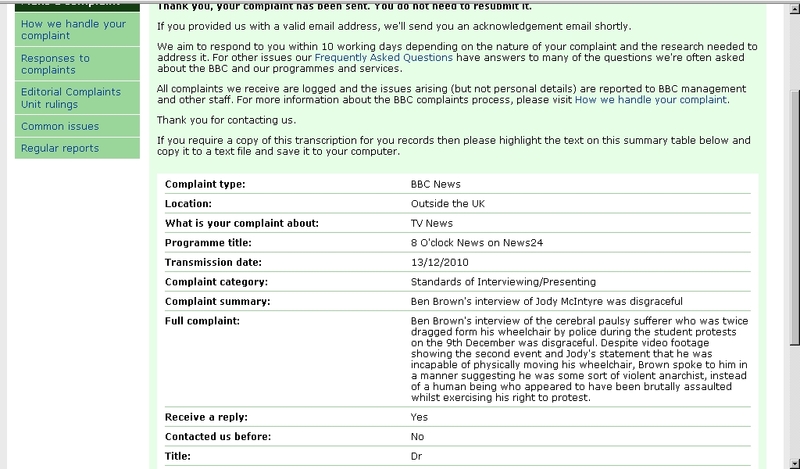 You may not have heard but the BBC dork-in-charge of belittling the disabled has responded with brazen incomprehension at the barrage of complinats it has received over this. I just received an email informing me of that response (two days after it had been posted, and after the comments facility had been closed). It's a complete nonsense. According to the BBC, "... we interviewed Mr McIntyre in the same way that we would have questioned any other interviewee in the same circumstances." If that means, "we were aggressive and dismissive of McIntyre in the same manner we'd be aggressive and dismissive of any other protester" then it's probably true (though Ben Brown's bizarre implication that rolling towards a line of armed riot cops in a wheelchair might somehow be a justification for several police officers to assault the occupant of the wheelchair still mystifies me). However, if the BBC are saying that they'd adopt the same attitude and interview technique when questioning, for example, a spokesman for the police...? Well that's just a bare-faced lie. Time and again on the day of the riots and the following day, members of the police force appeared on the screen and presented their side of the story without being challenged by those interviewing them. Yes, they got a couple of soft questions about the "kettling" tactic, but unlike with Jody McIntyre, there was never an overt implication that their actions might have warranted a violent response. Sure, the beeb aren't yet quite as bad as Sky News (who actually described the protesters as "insurgents" at one stage), but they seem determined to move in that direction.